His Grace, The Most Rev. 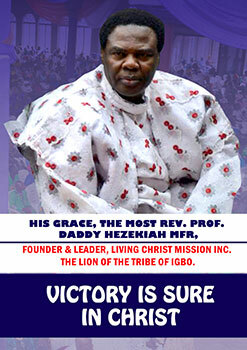 Prof. Daddy Hezekiah MFR. As a human being who is not perfect and is bound to make mistakes, you should be ready to accept correction at all times. Happy divine birthday to the holy Princess of the Most High God - Princess Chukwunazaekpere Hephzibah Favour Hezekiah. Shepherd Mother-General Living Christ Mission Worldwide. We wish you more fruitful years of service ahead.